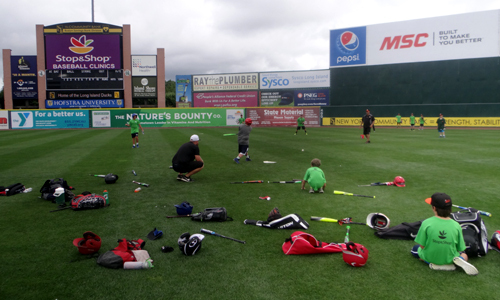 The Ducks hold multiple two-day clinics each season at Bethpage Ballpark This exclusive partnership includes naming rights of these clinics. The Camps partnership is an outstanding marketing vehicle for potential sponsors to extend their visibility in the community as well as at the ballpark. Promotional Components: As the presenting sponsor, you will receive the following: Name association with the clinics. In all materials, the clinics will be referred to as the Ducks/Your Company Clinics presented by the sponsor. Your company logo will be included on all printed materials including, but not limited to, brochures, flyers, and sign up information. Your company logo will be featured prominently on all apparel distributed at the clinics including jerseys, t-shirts and bags. Finally, your organization will also enjoy sponsorship of the clinics page on www.liducks.com. 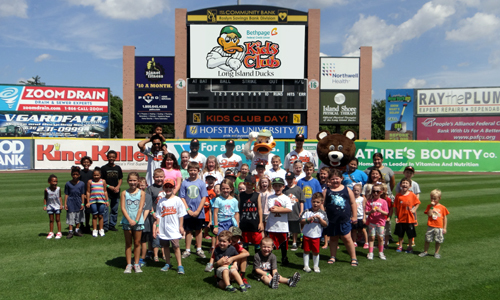 Be the exclusive naming rights sponsor for the Long Island Ducks highly successful kids club. The Kids Club is aggresively promoted by the Ducks, along with your company name through newspaper advertisements, brochures, yearbook ads, and PA announcements. Children enrolling in the Kids Club receive a membership card, merchandise, and discounts at the Waddle-In Shop. A great way to expose your company name through advertising both in and out of the ballpark.